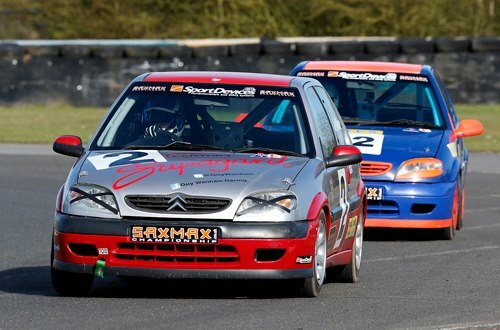 Coming from their most successful weekend in Saxmax so far this season at Mallory Park, Century Motorsport were aiming for more of the same as the championship resumed at Anglesey in North Wales. Championship leader Guy Wenham was aiming to keep his unbeaten record of race victories in tact after an eventful race two at Mallory while Martin Poole had shown that he has now fully got to grips with his new mount. Qualifying would appear to be a routine affair for Wenham as he bagged pole for race one from early in the session. 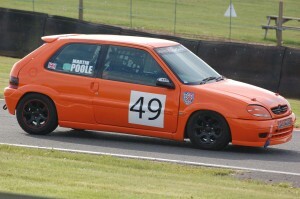 Martin Poole continued to show his impressive form earning fourth on the grid for the afternoons opening race of the weekend. A good start for both drivers allowed Guy Wenham to open a small lead on the opening lap. Martin Poole didn’t hang around either and was quickly up to third before a damaged shock absorber would make his Saxo a tricky car to maintain pace with the main pack. Out in front Wenham was showing he remains the class of the field as he continued to extend his leading advantage. Martin Poole was now using every ounce of skill he had to try and remain as far up the order as possible, but Anglesey’s super fast straight left him with little option but to relinquish a number of positions during the race. Out in front it was Guy Wenham who claimed yet another Saxmax race victory to maintain his 100% winning record so far this season. Martin Poole nursed his car home in seventh after working hard during the race to overcome his mechanical woes. Race two would see Guy Wenham starting from pole position once again, however Martin Poole struggled to get a good lap together in race two qualifying and would start the race from eighth position. Another good start off the line for Wenham left him in the lead out of turn one. However a challenge for the lead at turn two was quickly covered off before he pulled away to open a slender margin at the end of the opening lap. Martin Poole got another good start to move up to seventh off the line but his race was hampered a little as he was locked in battle for the majority of the race with Tom Stockton. Eventually the latter would find a way past after seven exciting laps and Martin crossed the finish line in eighth position. Out in front though it was Guy Wenham who was once again the class of the field taking yet another race victory and moving ever closer to becoming the most successful Saxmax driver ever.